It seems like AMD has yet again failed to manage the demand of their Radeon R9 Fury cards as their main AIB partners have been deprived from getting hands on any Fiji Pro chips. The Radeon R9 Fury that launched last week at $549 US has yet to show up on online retail channel and while the reviews showed it as a good knock between the GTX 980 and GTX 980 Ti, sales have yet to begun and we are already hearing reports that there isn’t enough quantity shipped to board partners. The report that comes from Hardwareluxx mentions that yields of Fiji chips are the main reason to blame the delay of reference and custom boards. 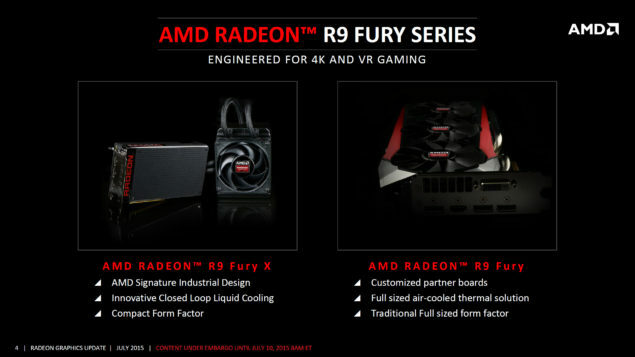 AMD has long faced a hard time with their new Fiji based cards as they were delayed on several occasions, just to launch on 24th of last month (June 2015). The launch was a bit shaky with the new HBM powered card with 512 GB/s bandwidth performing similar to the few months old GeForce GTX 980 Ti graphics card which is based on a cut down GM200 core. What was worse that the Radeon R9 Fury X not only had the same price ($649 US) but was also limited to just reference variants while overclocked and custom variants of the GeForce GTX 980 TI at $699 US were already breaking away performance records. Even being based off a elegantly designed AIO water cooler, the card featured a noisy pump, coupled with coil whine issues that made the Sapphire’s Tri-X cooler with three fans a better and audible solution compared to AMD’s reference design. The story of the Radeon R9 Fury (Non-X) isn’t great either. Currently, there are two models which have been launched by partners. One from ASUS which is their STRIX Radeon R9 Fury and one from Sapphire which has the Radeon R9 Fury Tri-X. None of these models have yet to appear on online retail sites and will only start to appear later tonight since the 10th July announcement and reviews were part of a paper launch. According to the source, there’s no telling just how many samples would either company have been shipped by AMD. AMD isn’t replying in specific to anyone regarding yields but it can be seen that the issue is pretty serious. Quantities of R9 Fury X were also limited due to which the card was able to sell out during its launch day. Even right now, stores are unable to get new stock and most of them are out of stock when it comes to availability of R9 Fury X cards (Newegg). The shocking thing about this launch has been the fact that out of AMD’s several board partners, only ASUS and Sapphire have got hands and able to produce custom R9 Fury cards. Even though Sapphire’s solution is just the reference PCB with their own Tri-X cooler, it does provide a 40 MHz clock speed boost over the reference cards. AMD partners such as XFX, Club3D and PowerColor haven’t even been announced yet while Gigabyte and MSI who fall in the same tier as ASUS have yet to get hands on enough Fiji Pro chips to start mass production on the custom boards. While coming to the market, it’s not known for how long would we have to wait for more Fury cards to hit the market.